Are you looking for someone to help you prepare your tax return or settle a tax debt? How do you know who you can trust with your financial information and tax status? Before hiring a tax settlement professional, you should ask the following questions to make sure you will get real help with your taxes. 1. Are you registered with the IRS, and do you have a Preparer Tax Identification number (PTIN)? Tax settlement professionals must be registered with the IRS and have a PTIN in order to collect a fee for preparing taxes. In addition, tax preparers must sign any and all tax returns they prepare as well as enter their PTIN number on the applicable forms. There are IRS penalties for using a tax preparer that is it not registered, and also for missing signatures or PTINs. Professional Tax Resolution has experienced registered tax professionals that are ready to help you with your tax returns or negotiate a tax settlement. 2. Do you have credentials? Tax preparation experts and tax settlement professionals who have passed an IRS test and are designated Registered Tax Return Preparers are one of the following: Enrolled Agents, Certified Public Accountants, attorneys, or “unenrolled” tax professionals. To keep this designation, they are required to log 15 hours minimum on professional continuing education on federal taxes each year. Professional Tax Resolution has licensed CPAs that have extensive experience and training with preparing tax returns and resolving tax issues. 3. What will it cost to complete my tax return? The amount of your refund should never be a factor in determining your tax preparer’s fee. The amount that each accountant or tax settlement professional charges should be based on an hourly rate, the number of forms and schedules that must be included in your tax return, or a combination of the two. Professional Tax Resolution offers a free consultation and assessment of your tax situation, and payment terms are set up accordingly. 4. Will I receive my tax refund directly? Your refund should always be sent directly from the IRS to you, whether by check or direct deposit. 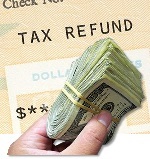 Never allow your refund check to be deposited with your tax professional! Professional Tax Resolution can help you set up direct deposit for your refund, which is the safest and fastest way to receive it. 5. What kind of returns do you have experience preparing? What state you live in, the type of work you do, and your specific circumstances can impact what forms are required with your tax return. These circumstances can also affect your deductions as well. Look for a tax preparer who has specialized experience with your situation. Professional Tax Resolution has helped clients nationwide with individual and business tax returns in greatly varied tax situations. 6. How much experience do you have with preparing 1040s? You should find out how much training and experience your tax preparer has. It doesn’t hurt to know how many tax seasons your tax specialist has prepared 1040s for, or how and where they learned to prepare them. Professional Tax Resolution was started in 2007, but the staff has decades of combined experience in tax preparation. 7. Are you a member of a professional organization? Because tax laws are constantly changing, you want an accountant or tax settlement professional who is a member of an organization that provide continuing professional education of high-quality to ensure the tax preparer is aware of the latest tax legislation and updates. The tax settlement professional may also be help to a special Code of Ethics with the organization. Professional Tax Resolution has staff with membership in the California Society of CPAs, the California Board of Accountancy, and the American Academy of Tax Practice. 8. What happens if I am audited? You should know what your tax specialist’s policy is if the IRS questions or audits your tax return. Will the tax preparer act as an advocate on your behalf and respond to letters of inquiry from state tax agencies or the IRS? Will your preparer attend or help you prepare for an audit? If the return has an error that results in a penalty that is the preparer’s fault, what will the preparer do? As Professional Tax Resolution employs licensed CPAs, the company can provide a specialist in IRS audit defense representation. Most tax preparers are not equipped for this level of representation. The outcome of your audit is very important, because penalties and interest can as much as double your original tax assessment and these adjustments can also be matched by your state tax agency. A successful audit results in no additional amount owed. 9. What is your availability throughout the year if I have questions or need help? It is important to know whether your tax preparer is only active during tax season and if you will be able to receive help with tax planning, questions, and advice during the year. This is especially important if any problems arise with your return, such as the audit situation mentioned above. Professional Tax Resolution is open year-round to help you with your tax needs as they arise, not just during tax season. 10. How do I know I can trust you? While credentials can sound impressive, you also want to know whether your tax preparer has received any positive reviews or complaints. You can check the local Better Business Bureau and other resources for this information. Professional Tax Resolution provides excellent service for clients and has an “A” rating from the BBB, and perfect reviews listed on the independent review verification sites TrustLink and MerchantCircle. If you need help with an outstanding tax debt or with your tax preparation, our experienced tax settlement professionals can help. Please call us at 877-889-6527 to receive a free, no obligation consultation.